In Centre Prague Large Flat Design/Old town in 10 minutes,tactical area,8 BEDS! 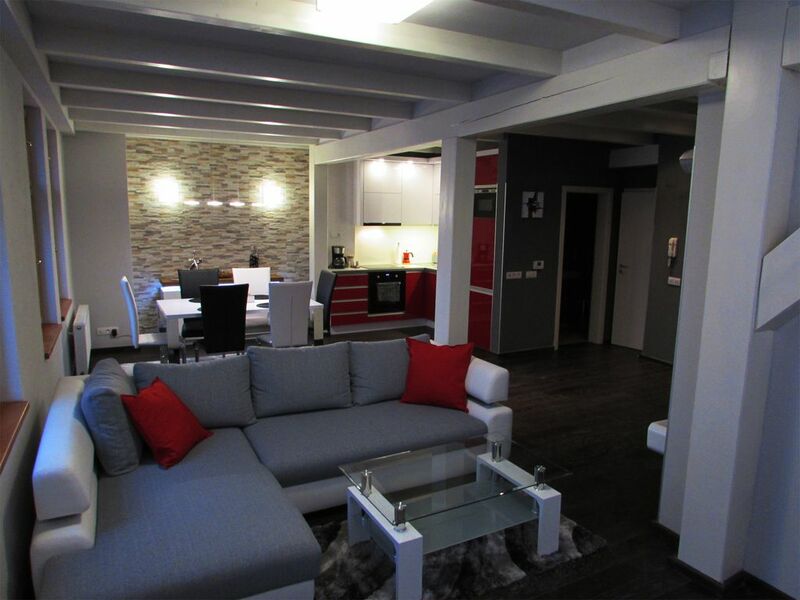 An attic with modern touches, fresh restructuring, a few minutes from Venceslao square. Tram and subway under the house and you can reach the main tourist attractions in a few minutes walking. The attic have two levels in the center, 10 minutes from Wenceslas Square and 5 minutes from the Dancing House. A pleasant walk along the river to arrive in 15 minutes to the Charles Bridge. The loft has two bedrooms upstairs plus a living room including a sofa bed for two additional guests and equipped kitchen with oven and microwave, large dining table, dishwasher, electric hob and fridge freezer, also have a room equipped with washer / dryer with hoxygen bubbles. The upstairs bathroom is equipped with bathtub,sink, toilet and bidet, the one on the lower floor has a shower,sink and toilet. The whole apartment is available to guests. I was born in Italy, where I lived until last year. I decided to change my life, starting in the magic Prague, I know very well because there was born and live my mom. I love to travel, I try to dedicate my time to new experiences. Very happy with our stay. Apartment was very clean and comfortable with all amenities, including washer and dryer. The owners were great, we were late to check in and they waited for us for close to 2 hours. Public transportation is great in Prague and the bus stop is right across the street. The only downside is that the bedrooms are all on the second floor but still a great place to stay. Rental was very clean, host very helpful. Location close to all the sights but not in a heavily touristed area. Very close to public transportation. Would stay here again. I stayed in this flat for 5 weeks this summer with some friends and we all LOVED it! The location absolutely cannot be beat, as you are close to multiple tram stops and a Metro stop as well. You can get anywhere in the city right from your front door! Antonio and Valentina are unbelievably sweet and the flat was kept immaculate. They provided us with a map and tour suggestions, and were easy to get ahold of any time it was necessary. It's easy to provide for yourselves, too, because there is a grocery store and a store full of toiletries night downstairs. There's also a great bakery just around the corner! The flat has plenty of space, and lots of room to unpack and hang clothes, and the appliances are all new; I loved toasting up bits of baguette and scrambling some eggs in the mornings! All in all, I'd recommend this place to anyone looking for a place in Prague! I myself plan on going back in the future! Well-furnished spacious accommodations close to everything. The owner Antonio was friendly, generous and accommodating. The apartment is close to a city center, shopping, transportation and restaurants. There is an elevator in the building but steep narrow metal stairs leading to the bedrooms are not suitable for mobility challenged travelers. I have stayed in many apartments during my travel and this location could not be beaten. Fabulous stay. Location was perfect and owners were very hospitable. It’s the perfect property in Prague. Apartment is very spacious, metro is right outside your front door and you are literally 10 minutes from any location in the local area. Owners were very accessible and helpful when we had questions about the apartment or local area. We will definitely return and use this property again. Many thanks! We were 4 retired women and found the location to be very convenient to transportation and an easy walk to to the major sites. There were plenty of good restaurants nearby. The decor was charming. The owners were very gracious and responsive. They met us at the apartment and explained the apartment and recommended restaurants and services in the neighborhood. The ceiling heights in the bedrooms are rather low, so we had to be careful getting out of bed. The spiral staircase, leading from the living room to the upstairs bedrooms, is challenging for older people. Overall, we enjoyed the apartment and would stay there again. Originally built as a cattle market, Charles Square is the largest square in Prague. The two most famous buildings include the City Hall of the New Town (Novomestská radnice) where took place the first Defenestration of Prague in 1419, and the baroque Jesuit church of St. Ignatius, 1671. The New Town Hall was the seat of the First Defenestration of Prague July 30, 1419: an anticlerical mob led by Jan Želivský asked the release of some prisoners Hussites; the refusal demonstrators threw a Catholic leader and his advisers down from each window. Today the building is home to cultural and social events and the beautiful Gothic hall will celebrate the wedding. The church of St. Ignatius appears right from the facade like the typical baroque church, sumptuous and luxurious, built by the Jesuits to attract the poor to faith with the Church's wealth.